What Is Josh Fox Smoking? Tobacco Money! Josh Fox is, perhaps, the most hypocritical of all fractivists. He’s been trying to tie the gas industry to tobacco for at least two years but it’s his own house that’s built on tobacco. Back in 2012, Josh Fox did an interview with Truthout, the Park Foundation funded blog ($60,000 since 2010) that regularly does the latter’s bidding by attacking natural gas development, and hydraulic fracturing or fracking, in particular. 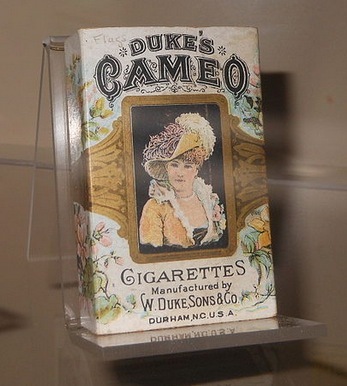 He used that opportunity to put forward a make-believe connection between the gas industry and tobacco. This appears to have been a Freudian slip at best, or deflection by accusing others of what you’re doing at worst, for Josh Fox is the one with the real tobacco connection and addiction. A PR firm called Hill & Knowlton decided to push out bogus statements and bogus science saying cigarettes are not bad for you, that medical reports about how it leads to diseases like cancer were not true and were exaggerated, and they created doubt in the public’s mind. As long as there was doubt, people continued doing the things they were addicted to. The same strategy has been employed by the gas industry, and in fact, the very same PR firm employing this strategy, Hill & Knowlton, was employed by the American Natural Gas Alliance in 2009. And the idea here is, “We’re going to seed doubt; we’re going to say this is naturally occurring methane; we’re going to say the science is in question,” when in fact they know full well that the science is not in question. It helps maintain our addiction to fossil fuels. And there is another connection to tobacco: these things are very harmful to health. Health impact studies have shown that living near gas drilling is very, very harmful. There is a likelihood of moderate to high health effects from living around this development. So, the film is talking about both the New York plan and the fact that the gas industry has spent millions of dollars on a disinformation campaign that is by-the-book adopted from the tobacco industry. It’s an artful argument, but using the same advertising firm as another industry from more than four decades ago is hardly a strong connection, given the thousands of clients Hill and Knowlton have had over the years, including, more recently, California Almonds, Ford, the recycling industry and even Jack Bauer. It’s like calling a vegetarian a liar today because he patronized a McDonalds in 1968. Notice, too, how Fox cleverly skirts the issues, never denying methane migration is naturally occurring or can come from all sorts of activities. He also suggests “these things” are unhealthy or unsafe without ever saying exactly what he means by “these things” because, of course, he wants the reader to think it’s hydraulic fracturing or fracking when that process has absolutely nothing to do with methane migration. He continuously conflates drilling and fracking to make-believe they are the same but, of course, they’re not. He also pretends it is only the natural gas industry or Hill & Knowlton saying fracking is safe when, in fact, it’s also the last two EPA Administrators and a host of other Federal and state officials. All this is beside the point, though, because Josh Fox is one with the connection to tobacco and it’s a big one. We noted in our post two days ago the connection between Josh Fox and the Multi-Arts-Production (MAP) Fund, which is one of his funders. That organization is primarily funded today by the Doris Duke Charitable Foundation (worth $1.75 billion and growing). What I did not realize until a reader and contributor pointed it out to me was this; it’s tobacco money. 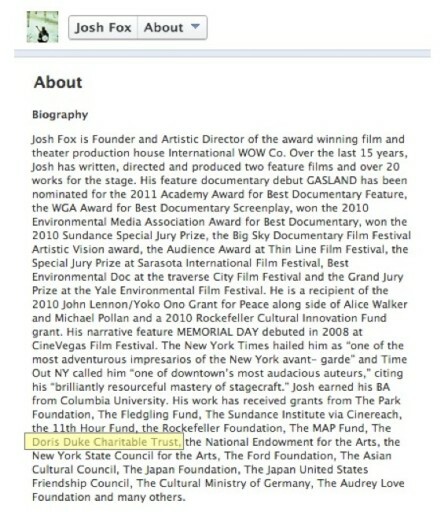 Tobacco money, therefore, funds the MAP Fund and the MAP Fund finances Josh Fox. 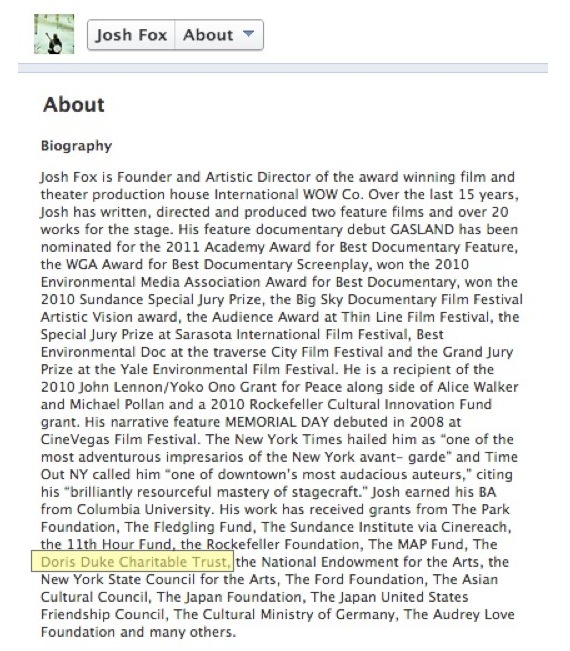 The Doris Duke Charitable Foundation even issued a news release identifying Josh Fox as a recipient of the tobacco largesse and Fox himself identifies the foundation as a contributor on his Facebook page (see screen shot below). 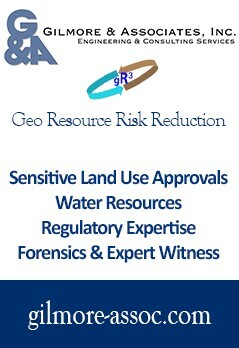 The organization also lavishes extensive funding on the NRDC and its stepchild, the Open Space Conservancy–over $9 million in total to these two Rockefeller-related entities who are so involved in the war against fracking. It even gave money to the Energy Foundation ($14 million in 2008 alone), demonstrating yet again, how just a few groups of wealthy special interests finance the entire war. “What goes around, comes around,” it is said, and how true it is. Josh Fox has been telling us how the gas industry is following a tobacco strategy, based on the flimsiest of evidence while he’s been taking money from the estate of an unconventional and eccentric tobacco heiress worth billions when she died. It’s a good fit, though, Duke having been exactly the type of individual who is behind the scenes of fracking opposition today; eccentric in their opinions for the sake of attention (think Yoko Ono) and unconventionally wealthy (think Park, Rockefeller, Schmidt, et al). “The more things change, the more they stay the same,” another of my favorite proverbs. He’s smoking alright, but it’s not cigarettes. Pingback: Shale Markets, LLC / What Is Josh Fox Smoking? Tobacco Money!